To become the leading manufacturer of High quality Laminates. The Quality consciousness & the technical knowledge of the directors always give the better product in the market. Monal group having long history in ceramic world, In 2009 group decided to divercify business in the laminate industry. Belador Laminate brand came in existence in 2010 with range of natural colors, spell bounding taxtures, romantic wood grain series to make Belador stand a part. The company has an experience & expertise of more than 5 years in manufacturing of decorative laminates. The Quality consciousness & the technical knowledge of the directors always give the better product in the market. Storage of the decorative and kraft paper. Coloured or decorated paper layer which confers the HPL its aesthetic properties. Generally brown raw paper - with exceptional resilience and resistance features – that will build up the core of the high pressure laminates. Quality control of raw materials inbound. Production of thermosetting resins according to Arpa's recipe. The resins will be later used to impregnate the decorative and kraft papers that create the HPL sheet. They can be phenolic (for the kraft paper substrate) or melaminic (for the decorative paper). Quality control of raw materials and finished thermosetting resins. In the HPL production process, the impregnation is the operation of preparation of the kraft and decorative papers. They are first soaked (impregnated) in thermosetting resins, then dried. The paper so prepared will give origin to the HPL sheet during the thermo-lamination process. Quality control of the semi-finished products. The impregnated kraft and decor paper is stored in appropriated and controlled environment rooms. In the HPL production cycle, the assembly is the act of overlapping the different kraft, decor and overlay sheets. Then they are ready to be carried in a press for the thermo-lamination. The thermal lamination is the irreversible process which gives origin to the HPL: the impregnated sheets of decorative and kraft paper undergo a simultaneous pressing and heating process at high levels of heat and pressure. The process provides the flowing of the thermosetting resins throuht the paper fibers and subsequent its curing to obtain a homogenous non-porous material (> 1.35 g/cm³) with the required surface finish. The resins are irreversibly interreacted through cross linked chemical bonds formed during the curing process producing a non- reactive, stable material with characteristics which are totally different from those of its component parts. Quality control at the end of the production process. 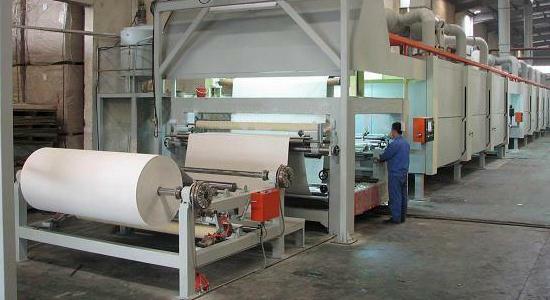 In the production of the laminate, trimming is the phase in which the edges of the panel are refined. Finally, panel back-side is lightly sanded to make the it suitable for gluing to substrates. Quality control and classification of the finished product. The quality control is performed according to the norm EN438. Finished product storage in specific warehouses. Packaging and transportation are carried out in accordance with Arpa General Processing Recommendations. For transportation, HPL is classified as a non-hazardous product.